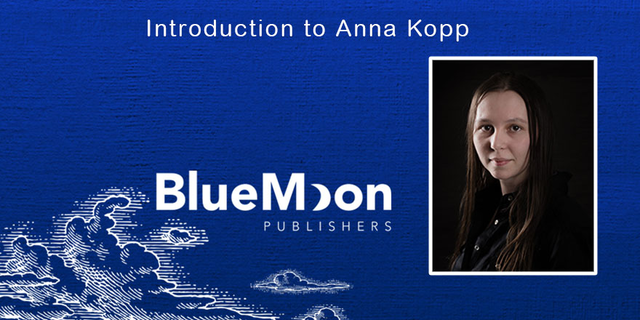 Join us as we chat with young adult author Anna Kopp, the newest member of the Blue Moon Publishers family! As a child, reading and writing for me was basically like breathing. My parents’ idea of “grounding” me was kicking me outside to play. I wrote poetry because it was big in Russia, and my mom would send it in to the local newspaper. When they never posted it, she sent a letter asking why, and received one back from the editor saying they “know when it’s the parent writing.” I guess what I’m trying to say is I’ve always been a writer – it’s who I am – just now, I’m a published one! The most natural parts of the writing process for me are the ones that come before actual writing. The ideas develop in my head like a movie and I see it, and feel what my characters feel (to the point of laughter or tears), until I’m bursting with emotion to where I have to write. My husband knows this as the “zombie Anna” because I just zone out throughout the day(s) until I finally get it out. The first thing I do when starting a new work is the outline. I open a new Word document and create each chapter with a small description. I’ve tried using several special programs (Sigil, Calibre) but to me, the simpler seems the better. I set a goal – 1000 words a day. It might seem small, but to me it’s an entire day’s work. Then go back the next day and edit the last day’s work. Then write. Rinse and repeat. I edit a lot as I write, and since I’m already using the least amount of words I can, it makes things easier. If I think of something that needs to be revised, I add it as a note on my phone so I can change it later. Currently, my only other available published works are a series of Minecraft children’s early reader books I made for my six-year-old. As most kids these days, he loves Minecraft, and I haven’t been able to find any related books for his age group – so I made some! Currently, I am working on continuing the Lifeblood series, as well as some unrelated young adult fantasy books. What does your writing routine look like? .